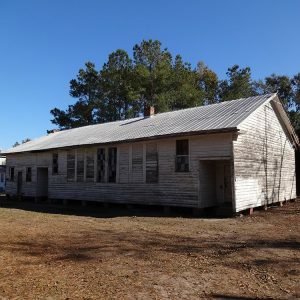 The first (c. 1921) of four Rosenwald schools in Hampton County, it had two to five teachers for an average of almost 200 students a year in grades 1-9 until it closed in 1958. Since then the facility has been used for church services and Sunday school classes. Marker sponsored by the Arnold Fields Community Endowment, the Faith Temple Deliverance Ministry, and the Town of Gifford Council, 2014.